You can transform a simple faux pumpkin into an eerie daisy Halloween vase by spray-painting the pumpkins with a matte black finish. Once the pumpkins have dried, carefully etch the surface and cut a hole in the top with a sharp paring knife. 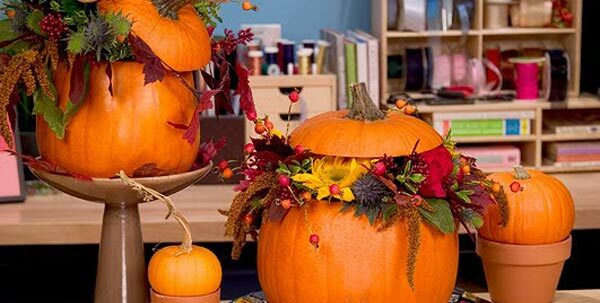 Then, fill with water and accurately measured flower food and drop in a bouquet of orange daisies to create an eye-catching Halloween masterpiece. You can find flowers at a variety of retailers such as your local supermarket, the neighborhood floral shop, online sellers or brick-and-mortar florist shops. You could even make your own black flowers… here are 3 Easy Techniques to Create Black Flowers. If daisies aren’t your style, other options include chrysanthemums in different colors, shapes and sizes. 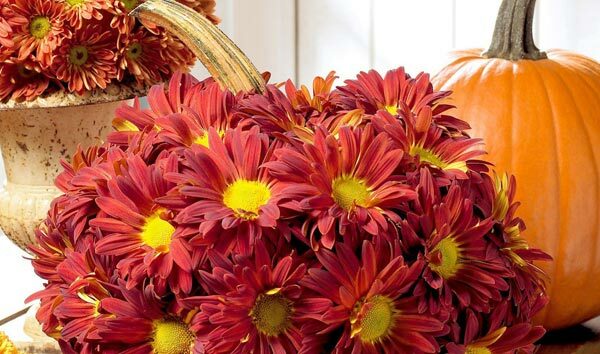 To add some interest to the display, use a variety of shades of orange-colored chrysanthemums. 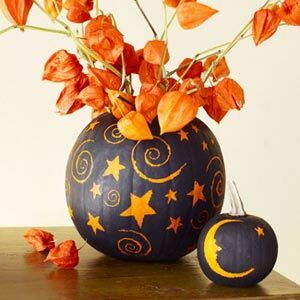 To add even more interest, use pumpkins in different sizes. Place some on the ground and place others on hay bales and upside-down baskets to add some height. What is Halloween without your usual pot-stirring, maniacally laughing witch? To recreate an iconic witch’s cauldron, sans the ickiness and gore, fill a black pot with natural, dried flowers, grasses and berries. Include a bag of scented potpourri and some bare branches to add dramatic–and aromatic–effect. Toss in a block of dry ice for additional spooky drama. Looking for more Halloween ideas? Check out our 9 Tips to Create Ghostly Decor. Guest has written 1 articles for us.